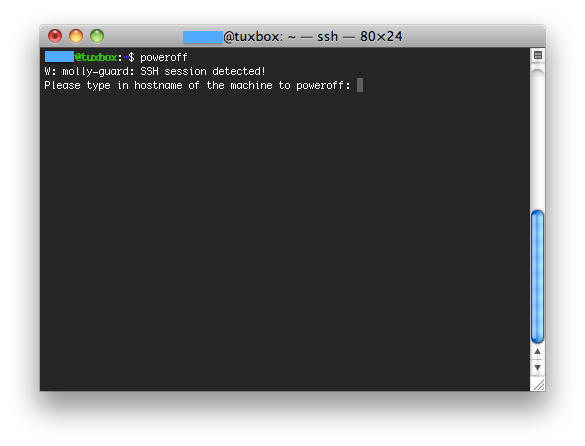 If you have one or multiple boxes running somewhere at a remote location and you manage them trough ssh, you’re possibly familiar with the following situation. It has been a long night. On your desktop there are multiple terminals gaping in the dark. During the whole night, some of these dark ships transported you to far remote playgrounds and back. The other ones were mere destined for local hocus-pocus. But it’s time to call it a day and go to bed. Now you have to get out of your chair, find those damned pants and go all the way up to the attic to switch it back on. No one likes this horrible situation. So Molly-guard is here to save the day. Molly-guard is is a bunch of scripts that capture the halt, reboot, shutdown and poweroff commands and give you a second chance. By checking if the tty has been created by sshd, it checks whether you’re logged on from a remote machine. If that’s the case, molly asks you the hostname of the machine you want to shut down. A shield to prevent tripping of some Big Red Switch by clumsy or ignorant hands. Originally used of the plexiglass covers improvised for the BRS on an IBM 4341 after a programmer’s toddler daughter (named Molly) frobbed it twice in one day. Later generalized to covers over stop/reset switches on disk drives and networking equipment. In hardware catalogues, you’ll see the much less interesting description “guarded button”.